09.06.2017. 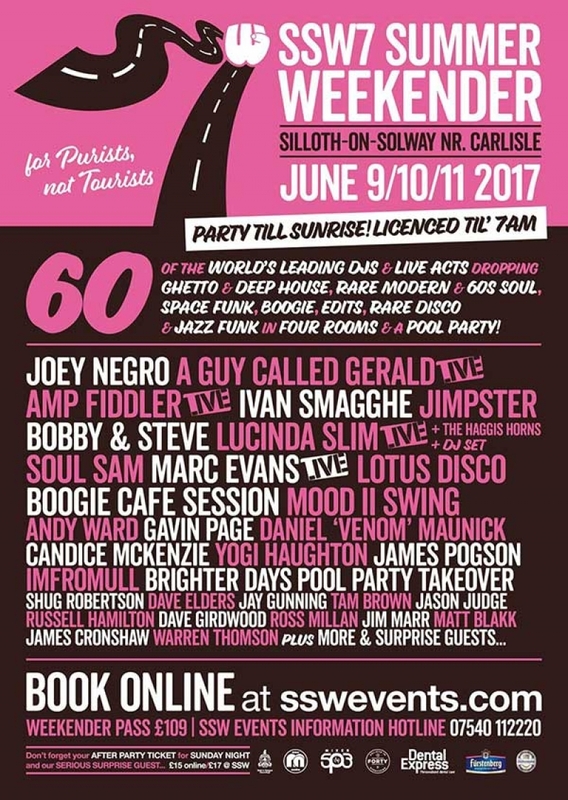 SSW Soul Weekender. Silloth, Cumbria. SSW has firmly established itself as a MECCA for people that love the purist and most UNDERGROUND forms of SOUL and HOUSE MUSIC around, played by the WORLD’S TOP DJS and EMERGING TALENT from around the globe. Also the performances from LEGENDARY LIVE ACTS & newly discovered talent make SSW a very special event. It’s about the superior sound systems with 30K of INCUBUS VOID SYSTEMS in our main arena, it’s about the FRIENDLY park staff and door stewards, it’s about the 7AM BARS, it’s about the brilliant train and motorway links to Carlisle that makes it so easy to get to by any mode of transport but most of all IT’S ABOUT THE MUSIC AND THE PEOPLE. So our incredible site is the stunning Stanwix Holiday Park in Cumbria, jus’ 20 minutes from Carlisle on the beautiful Solway Coast by the sea. Brand new Static homes, beautiful apartments, heated glamping pods, camping and bring yer own motor home or caravan & no electricity charges in any accommodation. This really is one of the best holiday camps in the UK and boasts all the modern day facilities that you are used to when staying in quality accommodation, indoor and outdoor pools, gymnasium, bowling alley, snooker table & all apartments and statics are self catering with central heating.